Ever considered speaking at a conference? Whenever I merely thought about public speaking, I could feel the fear coming up. Whenever I actually had to talk in front of a group, even a known one, I could feel my heart beating faster and me getting more nervous every second. This even happened when I joined a new team and it was my turn to speak in our daily scrums. Public speaking seems to be one of the major fears for a lot of people, and for me this is definitely true. Still, I made it as a newbie speaker to five conferences within eight months. If you wonder how, and especially if you wonder if you could do the same, then this story is for you. At FlixMobility Tech, some development teams started a series of small tech talks to spread knowledge, inspire others, or simply practice speaking. Every two weeks one person presented to the other teams the solution to a tricky problem their team found, a new library they discovered, or an interesting concept they read about. 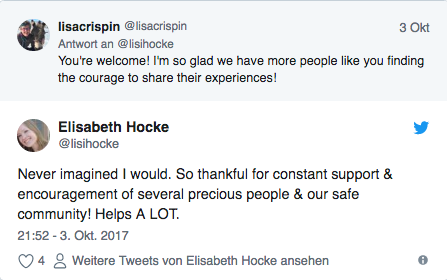 The audience consisted of a bunch of peer developers, welcoming and encouraging, and interested to learn continuously; a safe place to grow. I joined the company as the second tester overall and was eager to spread testing knowledge. The tech talks seemed to be a good place to do so, but at the same time I worried about how my fellow developers would receive a session about testing. As the goal to share knowledge was even more important to me than me feeling uncomfortable, I decided to give it a try. And didn't regret it! Especially the short hands-on session introducing exploratory testing to developers was fun for everyone. Even better: I felt rewarded by the response of my colleagues and encouraged to continue my knowledge sharing endeavors. So far, I haven't had the opportunity to attend many conferences yet. 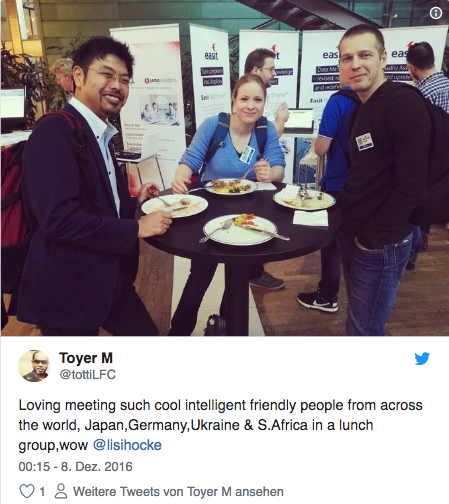 I got intrigued after I joined Agile Testing Days in 2015, and was eager to return to this conference to learn even more and get to know more peers outside my company. 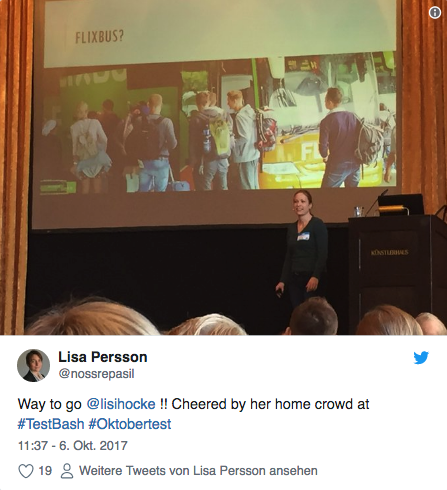 I was unbelievably happy when FlixBus supported me to join the conference in 2016 as well. They didn't know yet, but it was a pivotal moment in my life. The opening keynote of Agile Testing Days 2016 was held by Abby Fichtner, talking about "Pushing the Edge on What's Possible". It was absolutely inspiring and triggered people to talk about their fears. Just as I did with Toyer Mamoojee over lunch. This way we discovered that we share the fear of public speaking, like for example at conferences like this one. In this moment, he asked me for a deal. If I would submit a paper for next year's edition, he would have to do it, too. But if he submitted a paper, I would have to do so as well. In this moment I was so inspired that I decided to take a leap and agreed. We had a common goal: return to Agile Testing Days as speakers. The good thing: I was not alone. I had someone taking the same journey, holding me accountable, but also encouraging and supporting me on my way. And not only on this topic, through our pact we both found us as long-term learning partners, each helping the other grow. After returning home from the conference, I started to think about potential topics I could speak about. I shared my thoughts with my manager and several other colleagues who all brainstormed with me and gave me great input and feedback. I did some internet research on how great proposals look like as well as tips to write them. Having drafts for two potential talks, I gathered my courage and reached out to experienced speakers in the external community, asking whether they would be willing to review my proposals. There are many great speakers who are glad to help and provide feedback especially for newbies, and it was the same for me. It was invaluable to be able to revise the proposals based on their feedback before submitting them to a conference. 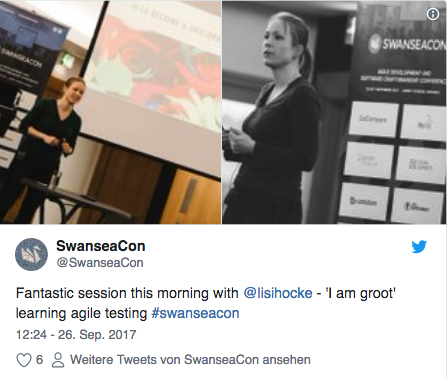 After my first two proposals were finalized and I submitted them to the first conference, TestBash Germany 2017, I tweeted about this personal achievement - and got invited to submit to SwanseaCon 2017 as well. Later on, I managed to submit even up to six proposals for Agile Testing Days 2017; several sessions together with other speakers. Now I only could wait for feedback from the respective conference program committees whether one of the proposed sessions would fit into their program. I got selected! Oh my, what have I done?? To my surprise, I got selected by all three conferences for four sessions - time to celebrate! But also time to worry that I really have to deliver now. What to do? When starting to think about our common session, Lisa Crispin gave me a tip she got from Janet Gregory: When you get selected, make a release plan for the session; no matter how long it is until then. This helps you managing to prepare everything at a sustainable pace. Sound advice! Especially as I had to prepare two talks (one repeated) and a workshop. So I created a Trello board including all the tasks I could already think of and added due dates to them so I would get reminded. I also added all things to prepare myself as first-time speaker, like researching how good talks are structured, how to best design your slides, how to train from the back of the room, and so on. Also, I came across other things to think about, like buying a remote presenter and cable adapters, or clarifying slide layouts or reimbursement policies with conference organizers. Having a release plan for my sessions helped me to keep an overview and spread the workload. Part of my release plan was to try out my sessions as soon as possible so I could get early feedback from a real audience and revise my sessions accordingly. Doing so helped me a lot and with each practice session I got invaluable input, my storytelling got better, my slides improved, and I could experiment how to deal with my nervousness best. You know, if something scares you, do it more often. As a first step, I scheduled tech talks to practice my sessions at my company. This way I had a smaller, well-known, and really safe audience first; and convey my messages as well. My colleagues provided lots of feedback and really helped me with further ideas to improve my sessions. Afterwards I challenged myself to speak at local meetups; now having strangers as well as local community members with different backgrounds as audience. The feedback they gave was great. The best was that many people told me that they had not been aware of the concepts and ideas I shared; so it was really valuable to them. Which was what I really worried about since the very beginning! Another thing that helped was the mere fact of learning that others face the same fears and stage fright as well, even really experienced speakers still struggle with it. Just knowing I'm not alone helped a lot. If you'd like to see for yourself, check out the #SpeakerConfession and #SpeakerConfessions hashtags on Twitter. Finally, the big days came. SwanseaCon was first, and it was an amazing experience. What helped me was that the conference was small enough to feel more like a bigger meetup, that it was in Wales where I hardly knew anybody, and that the people there were really friendly. At first, I worried about speaking about testing from a tester perspective at a developer conference, but was happy to see how diverse the whole conference program was so that my talk fitted in nicely and the audience really welcomed all kinds of sessions. Shortly after, I went on stage for the very first TestBash Germany, in my hometown Munich - which made it on the one hand harder for me, due to the feeling that I had to prove myself here, but on the other hand easier as well as I had many supporters in the audience. The other hard part was that the talk had been recorded and I couldn't get the cameras out of my head, which didn't help with my nervousness. 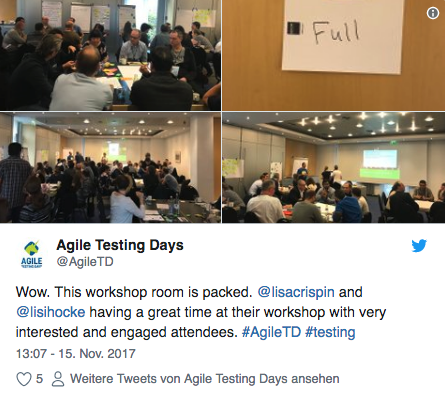 The last conference for 2017 was Agile Testing Days, where I could repeat one talk and also host a workshop together with Lisa Crispin. Both sessions were a wonderful experience as this conference and the community there felt like home already, I had many great people and supporters there, and many awesome conversations afterwards. Though I was still excited, my nervousness definitely got better already, It was fun to do both sessions and learn from the feedback of attendees as well as some really experienced speakers. And the best: Toyer and I could complete our initial pact here, as we both got selected as speakers and delivered our sessions. Now it was really time to celebrate! Well, I am still nervous as hell before I go onto a stage. All the way through, until it's over. But now I know that I can cope with that as well as have some strategies helping me to make it easier. All in all, I am really thankful that my company supports the endeavor to speak outside the company at meetups and conferences; I don't take it for granted. I got lots of support from inside and outside the company to make this speaker journey happen. In 2018, I got the opportunity to speak at further conferences. European Testing Conference in Amsterdam selected Toyer and me to tell our story as learning partners on stage. Mob Programming Conference in Boston invited me to faciliate two mob sessions. DevExperience in Iași asked me to give a talk there as well. And there are other conferences I submitted papers to as well. Let's see where the speaker journey takes me! Now that I've learned that it was feasible for me to overcome my fear of public speaking and manage to go so far, I would love to give back the support I received and help others with their endeavors. So if you'd like to try become a conference speaker yourself, if you'd like to get feedback on your proposal, tips for creating slides, structuring a talk, or facilitating a workshop, remember that reaching out for help is a good thing, so feel free to contact me via Twitter. I'd be glad to help!